easy and tasty egg free mango cake recipe made with whole wheat flour, fresh mangoes, butter and condensed milk. 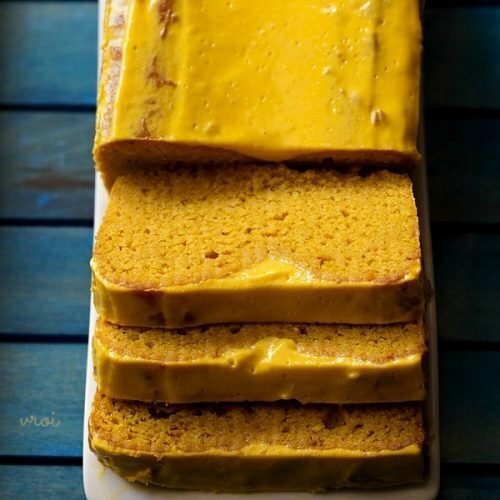 eggless mango cake recipe with step by step pics – easy and tasty egg free mango cake recipe made with whole wheat flour, fresh mangoes, butter and condensed milk. i have been getting a few requests to post an eggless mango cake since mangoes are in season. i did try making mango cakes many times, but something or the other was always lacking in terms of texture and taste in the cake. i gave a try again and adapted my eggless pound cake recipe for the mango cake. i made this cake twice. first time we just had the cake plain. second time i frosted the cake with a mango mousse icing. 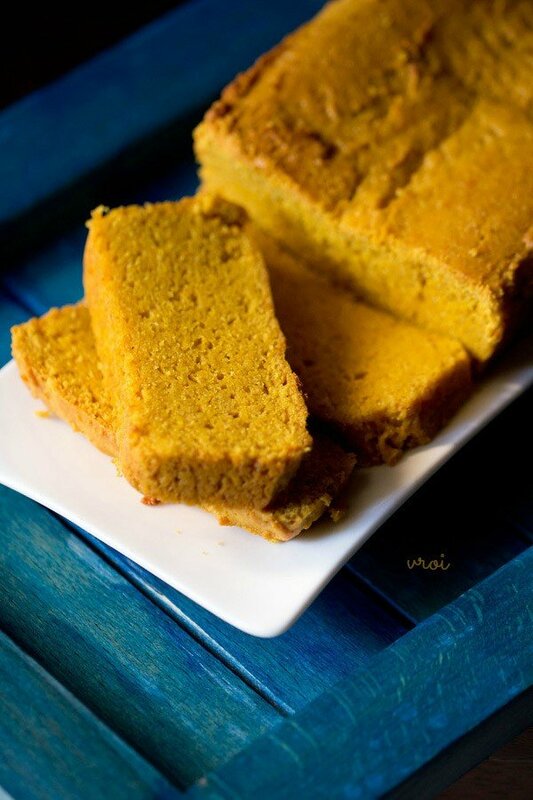 since i prefer to make healthy bakes, the entire mango cake is made with whole wheat flour or chapati atta. you can also make the cake with all purpose flour (maida) or half-half of both whole wheat flour and all purpose flour. the cake has a nice aroma of mangoes along with a light, soft texture. there is also the nutty aroma of whole wheat flour in the cake. 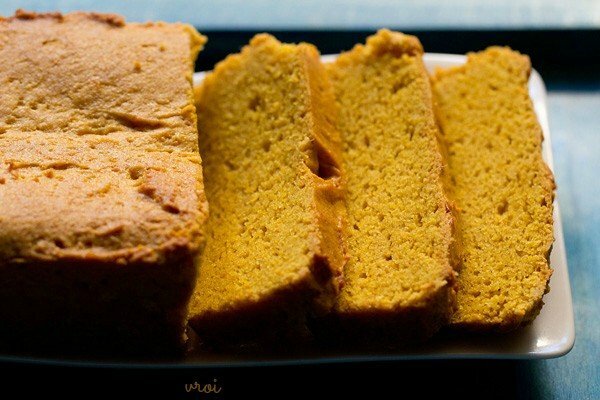 this eggless mango cake can be served as a dessert or with tea, coffee or milk. 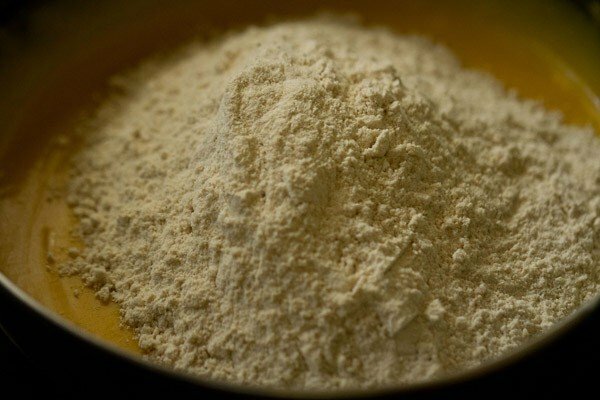 as mentioned above, all purpose flour or maida can be substituted for whole wheat flour. instead of fresh mangoes, store brought mango pulp or puree can be used. measurements given below. i used alphonso mangoes. you can use any ripe sweet juicy mangoes. just avoid mangoes with a fibrous pulp. both unsalted as well as salted butter can be used. i have made the cake with both the butters. instead of butter you can also use ⅓ cup oil. use a neutral flavored oil. this cake can be made in a pressure cooker but not in a microwave mode. although you can bake the cake in convection mode of microwave oven. the recipe cannot be doubled as it is. some experimentation is needed on your side to double it. if you use unsweetened condensed milk, then add sugar as per your preference. both baking soda and baking powder are required and cannot be substituted for each other. 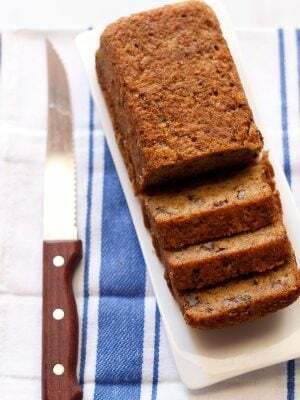 you can add flavorings or spices of your choice – cardamom powder goes very well in this cake. you can skip the frosting if you want. the cake tastes good plain too. or you can also frost the cake with your choice of frosting. if you are looking for more eggless cakes then do check sponge cake, black forest cake, banana cake, vanilla cake, tutti frutti cake and chocolate cake recipe. 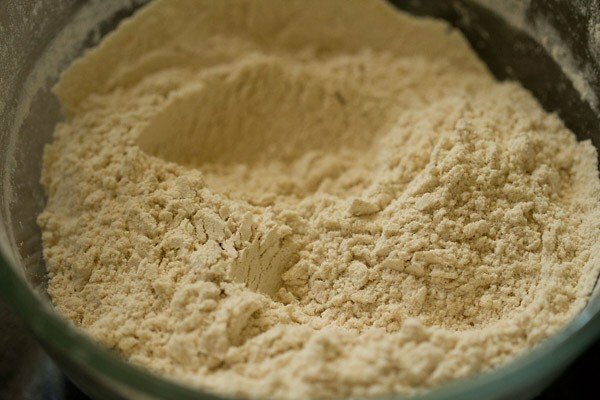 seive 1.5 cups whole wheat flour/atta, 1 tsp baking powder and 1/2 tsp baking soda in a bowl or plate. keep the seived dry ingredients aside. 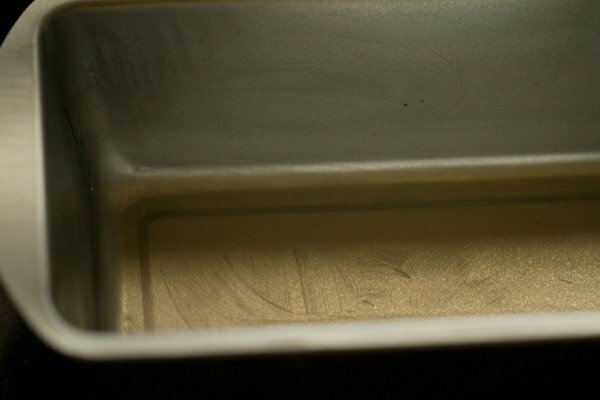 grease a loaf pan measuring 8.5 x 4.5 x 2.5 inches with butter or oil and keep aside. you can also use a round pan of 7 or 7.5 inches diameter. peel and chop 2 large alphonso mangoes and add the mango cubes in a blender. in cup measure, it should be 1 cup tightly packed chopped mangoes. 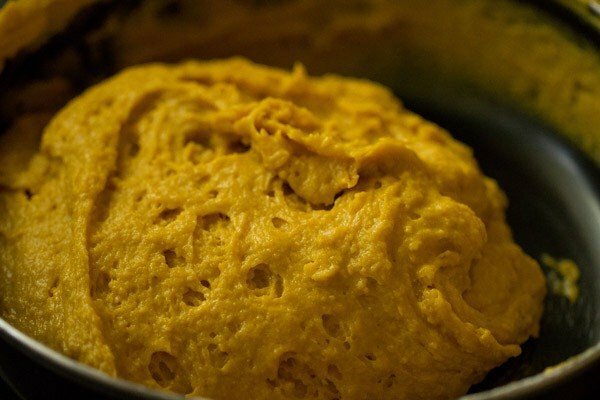 if using store bought mango pulp or puree, then use 1 cup mango pulp. you could also use any juicy mangoes instead of alphonso mangoes. also add 3 to 4 tbsp sugar. the addition of sugar depends on the sweetness of the mangoes. the mangoes i used very very sweet, so i added 3 tbsp of sugar. 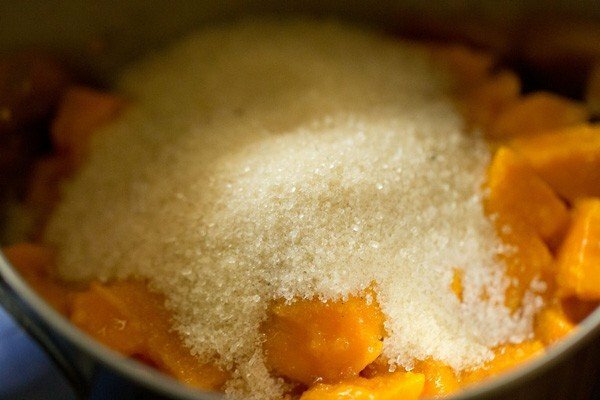 if the mangoes are not sweet enough, you can add 1 or 2 tbsp more sugar. 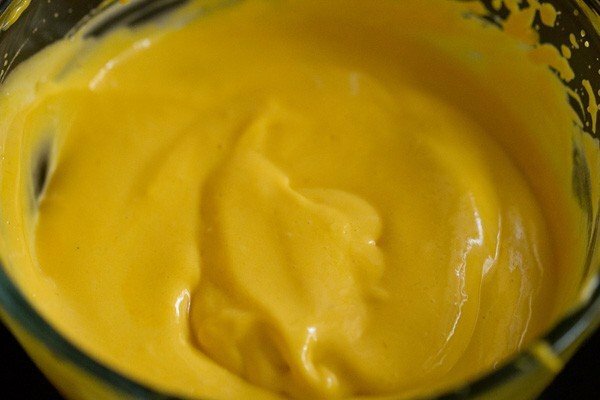 blend to a smooth mango puree. 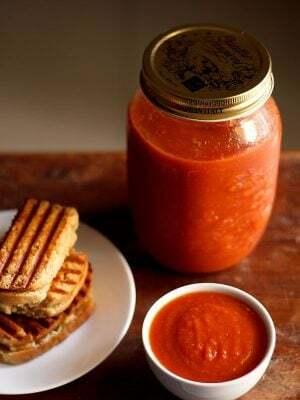 keep the puree aside. also preheat your oven at 180 degrees celsius/350 degrees fahrenheit 15 minutes before you start baking. for baking in the convection mode of the microwave oven, use 170 degrees celsius/330 degrees fahrenheit as the preheat temperature. take 100 grams unsalted butter or 1/2 cup chopped butter in a pan. 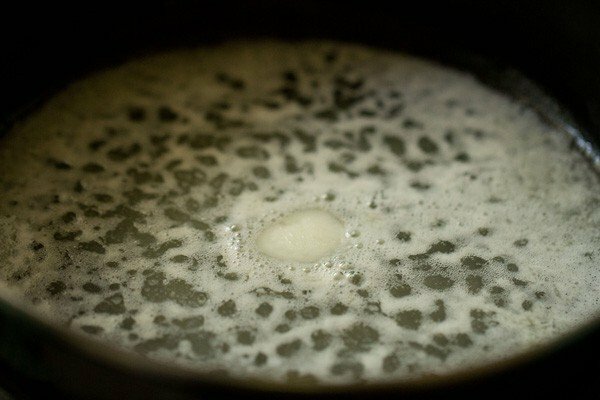 keep the pan on a stove top and on a low heat melt the butter. just melt the butter. no need to heat the butter. stir so that the butter melts quickly. keep the pan down once the butter has melted. add 3/4 cup sweetened condensed milk. condensed milk added is about 1/2 a tin or can of condensed milk measuring 400 grams. 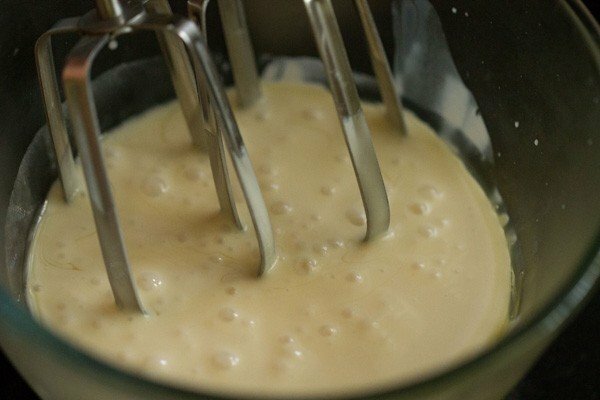 begin to stir very well with a wired or balloon whisk. 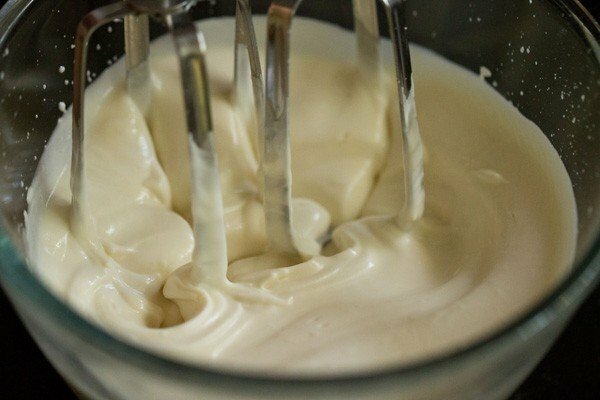 whisk very well to make a smooth homogeneous mixture. now add the mango puree and 1 tsp vanilla extract. you can also add 1/2 tsp cardamom powder or 1/4 tsp cinnamon powder or 1/2 tsp mango essence or extract instead of vanilla extract. stir again very well to get a smooth even mixture. add the flour. with light hands, gently fold the mixture with a spatula. avoid folding too much. the cake batter should have volume and should not fall flat or become doughy like chapati atta. depending on the quality of flour, you might get a thick batter like i have got. this much thickness is fine. but if the mango cake batter looks very thick, then do add some tablespoons of milk. 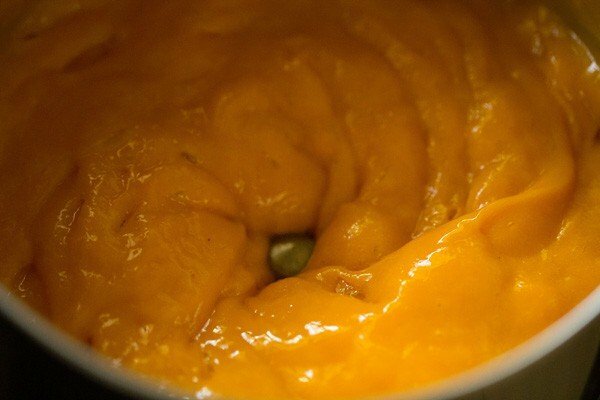 also mango puree made at home is usually thick. 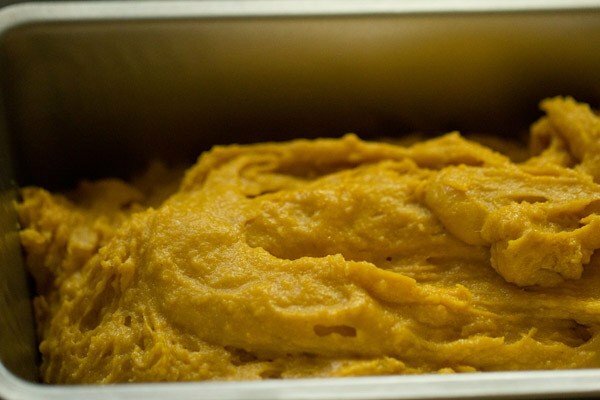 if you use store bought mango puree, then the batter will be slightly on the thinner side. with the spatula add the batter to the loaf pan. shake the pan to even the batter from the sides. also with the spatula even the batter from the top. place the loaf pan in the preheated oven at 180 degrees celsius/350 degrees fahrenheit. bake mango cake for 40 to 50 minutes. if top starts to get browned, then cover with foil or butter paper and continue to bake the mango cake. depending on the temperature conditions in your oven, it make take less or more time. the final check is a golden crust and a tooth pick or wooden skewer coming out clean. for baking in the convection mode of a microwave oven, use the temperature of 170 degrees celsius/330 degrees fahrenheit. again the baking time will vary in the convection mode of your microwave oven. when the mango cake becomes warm, remove from the pan and allow it cool on a wire rack. slice the mango cake and serve when cooled. you can also frost the cake with your favorite icing if you want. take 1/2 cup whipping cream or 25% to 35% low fat cream in a mixing bowl along with 2 to 3 tbsp honey or icing sugar. begin to whip the cream on a high speed. then add 1/3 cup mango puree. on the lowest speed blend for some seconds till every thing is mixed well. keep in the fridge till the cake cools down. when the cake cools down completely, slice carefully into equal halves. brush some sugar syrup (1 tsp sugar dissolved in 3 to 4 tsp water) on the halved cake. spread the mango mousse evenly. 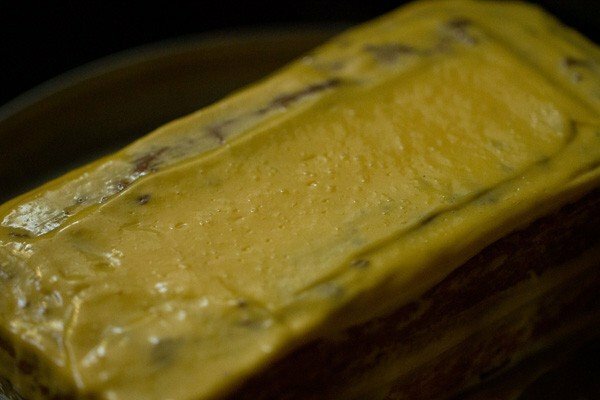 cover with the remaining half of the mango cake. brush some sugar syrup on top of the cake half. then again spread the top and sides with the remaining mango mousse frosting. for a neater look, you can thinly slice the top part of the mango cake. brush lightly with the sugar syrup and then spread the icing. with a spatula even the mousse frosting from the top. cover the mango cake without touching the sides and edges with a large box or bowl and keep in the fridge till the mousse sets. 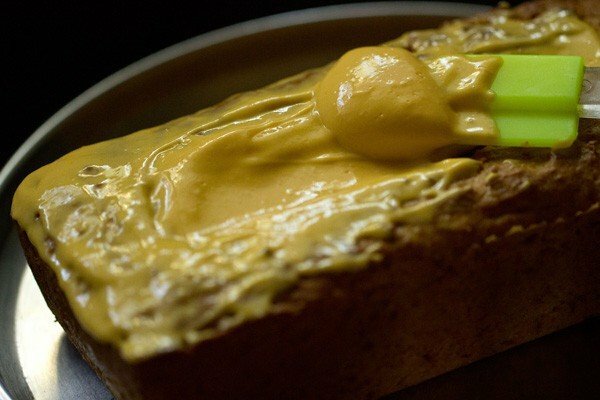 once done slice and then serve the eggless mango cake with mango mousse frosting. 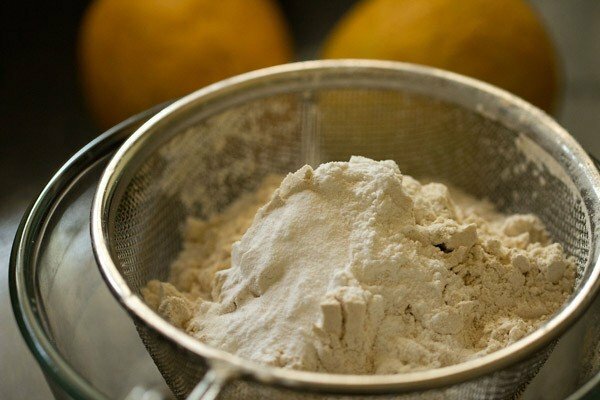 1. seive 1.5 cups whole wheat flour/atta, 1 tsp baking powder and ½ tsp baking soda in a bowl or plate. 2. keep the sieved dry ingredients aside. 3. grease a loaf pan measuring 8.5 x 4.5 x 2.5 inches with butter or oil and keep aside. you can also use a round pan of 7 or 7.5 inches diameter. 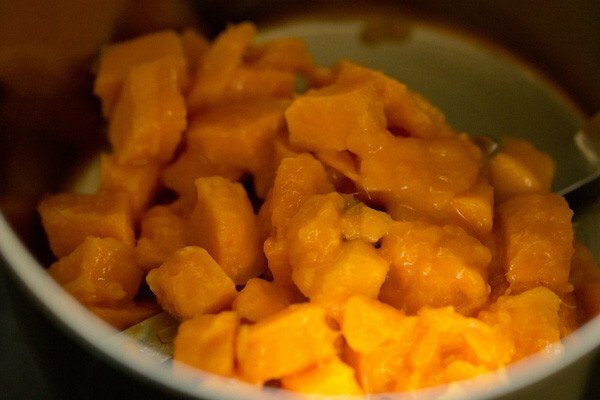 4. peel and chop 2 large alphonso mangoes and add the mango cubes in a blender. in cup measure, it should be 1 cup tightly packed chopped mangoes. 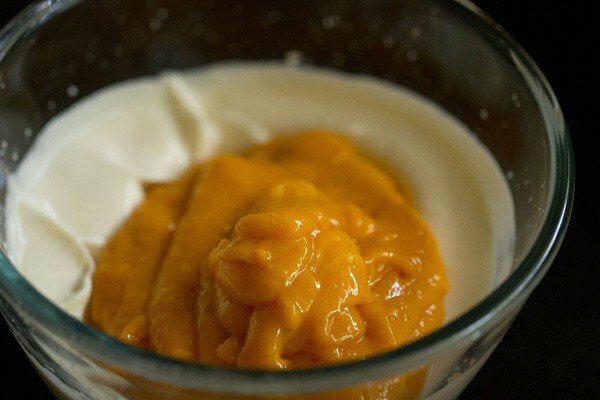 if using store bought mango pulp or puree, then use 1 cup mango pulp. 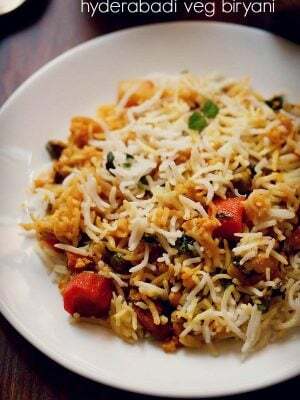 you could also use any juicy mangoes instead of alphonso mangoes. 5. also add 3 to 4 tbsp sugar. the addition of sugar depends on the sweetness of the mangoes. the mangoes i used was very sweet, so i added 3 tbsp of organic unrefined sugar. if the mangoes are not sweet enough, you can add 1 or 2 tbsp more sugar. 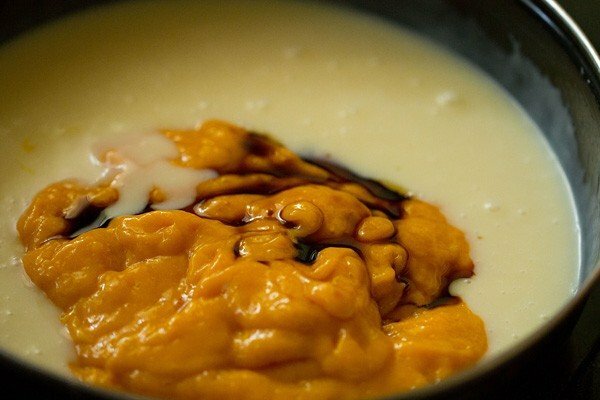 6. blend to a smooth mango puree. keep the puree aside. also preheat your oven at 180 degrees celsius/350 degrees fahrenheit 15 minutes before you start baking. for baking in the convection mode of the microwave oven, use 170 degrees celsius/330 degrees fahrenheit as the preheat temperature. 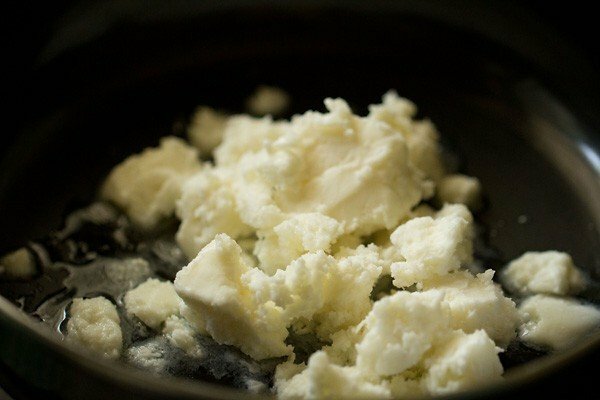 7. take 100 grams unsalted butter or ½ cup chopped butter in a pan. both unsalted as well as salted butter can be added. 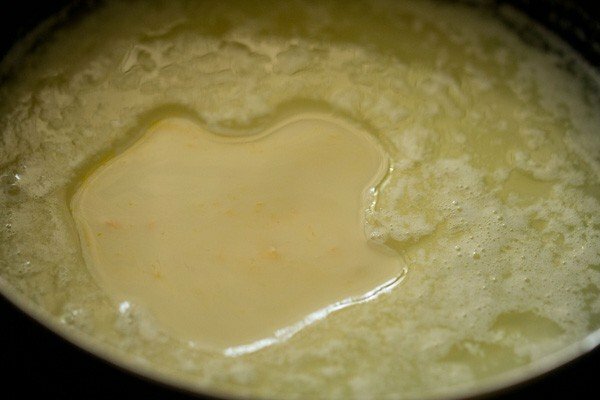 8. keep the pan on a stove top and on a low heat melt the butter. 9. just melt the butter. no need to heat the butter. stir so that the butter melts quickly. 10. keep the pan down once the butter has melted. 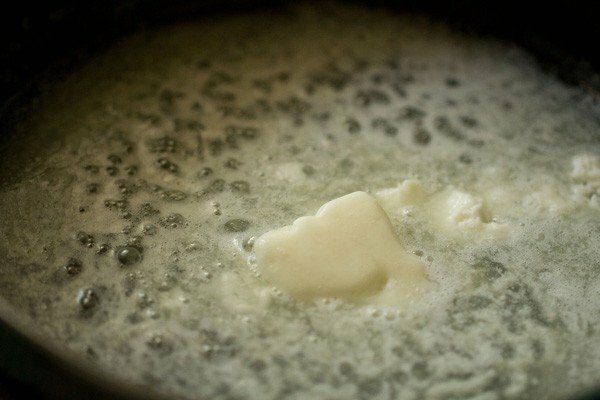 add ¾ cup sweetened condensed milk. condensed milk added is about ½ a tin or can of condensed milk measuring 400 grams. i used amul mithai mate. 11. begin to stir very well with a wired or balloon whisk. 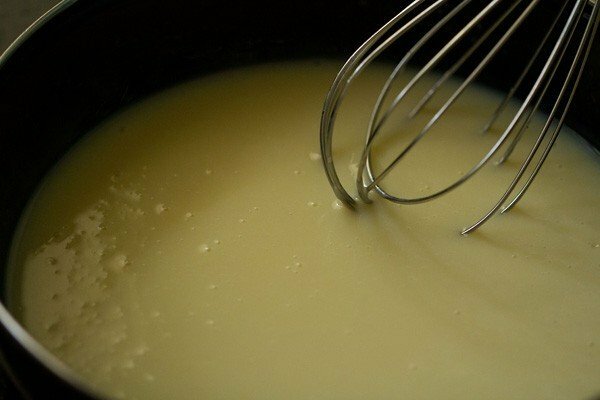 12. whisk very well to make a smooth homogeneous mixture. 13. now add the mango puree and 1 tsp vanilla extract. you can also add ½ tsp cardamom powder or ¼ tsp cinnamon powder or ½ tsp mango essence or extract instead of vanilla extract. 14. stir again very well to get a smooth even mixture. 16. with light hands, gently fold the mixture with a spatula. avoid folding too much. 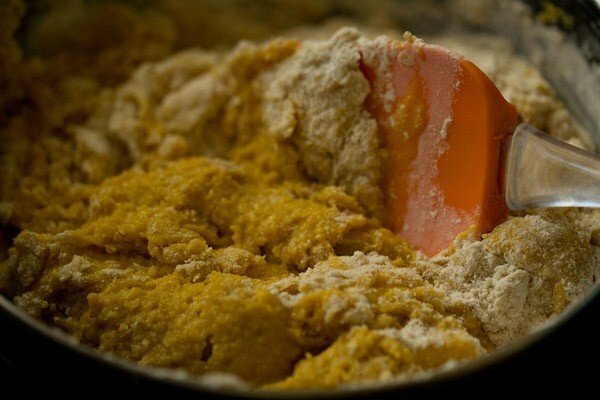 17. the mango cake batter should have volume and should not fall flat or become doughy like chapati atta. depending on the quality of flour, you might get a thick batter like i have got. this much thickness is fine. 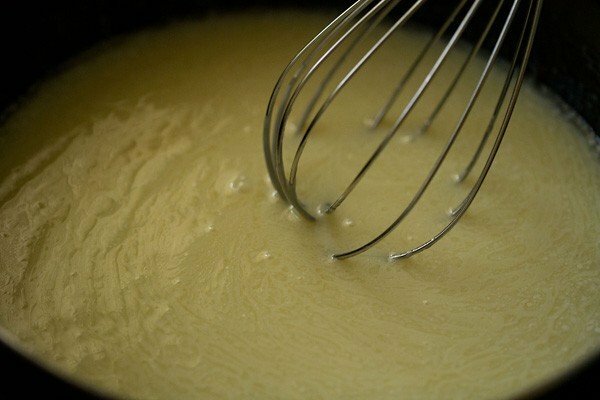 but if the batter looks very thick, then do add some tablespoons of milk. 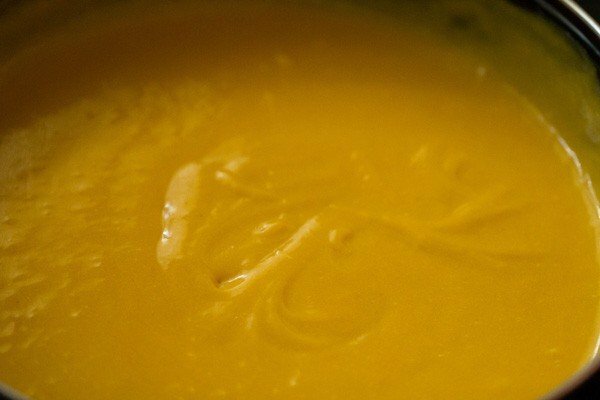 also mango puree made at home is usually thick. 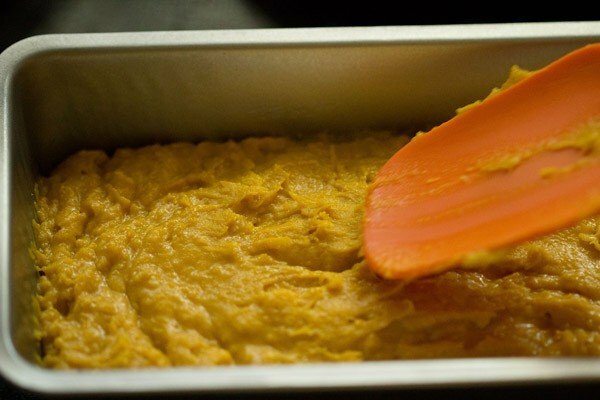 if you use store bought mango puree, then the batter will be slightly on the thinner side. 18. with the spatula add the mango cake batter to the loaf pan. 19. shake the pan to even the batter from the sides. also with the spatula even the batter from the top. 20. place the loaf pan in the preheated oven at 180 degrees celsius/350 degrees fahrenheit. bake mango cake for 40 to 50 minutes. if top starts to get browned, then cover with foil or butter paper and continue to bake the mango cake. depending on the temperature conditions in your oven, it make take less or more time. it took me 55 minutes to bake the mango cake. i did cover with a foil after 25 minutes of baking. the final check is a golden crust and a tooth pick or wooden skewer coming out clean. 21. when the mango cake becomes warm, remove from the pan and allow it cool on a wire rack. slice the mango cake and serve when cooled. you can also frost the cake with your favorite icing if you want. 1. take ½ cup whipping cream or 25% to 35% low fat cream in a mixing bowl along with 2 to 3 tbsp honey or icing sugar. begin to whip the cream on a high speed. i used amul cream and honey. 2. whip till soft peaks. 3. then add ⅓ cup mango puree. 5. when the cake cools down completely, slice carefully into equal halves. brush some sugar syrup (1 tsp sugar dissolved in 3 to 4 tsp water) on the halved cake. spread the mango mousse. cover with the other half. brush some sugar syrup on top. then again spread the top and sides with the remaining mango mousse frosting. for a even look and finish, slice the top part of the cake very thinly. spread the sugar syrup lightly. then spread the mango mousse icing evenly on the cake and all the sides. you can also decorate with chopped mango rosettes or slices or even with chocolate shavings, dry fruits etc. 6. with a spatula even the mousse frosting from the top. cover the mango cake without touching the sides and edges with a large box or bowl and keep in the fridge till the mousse sets. 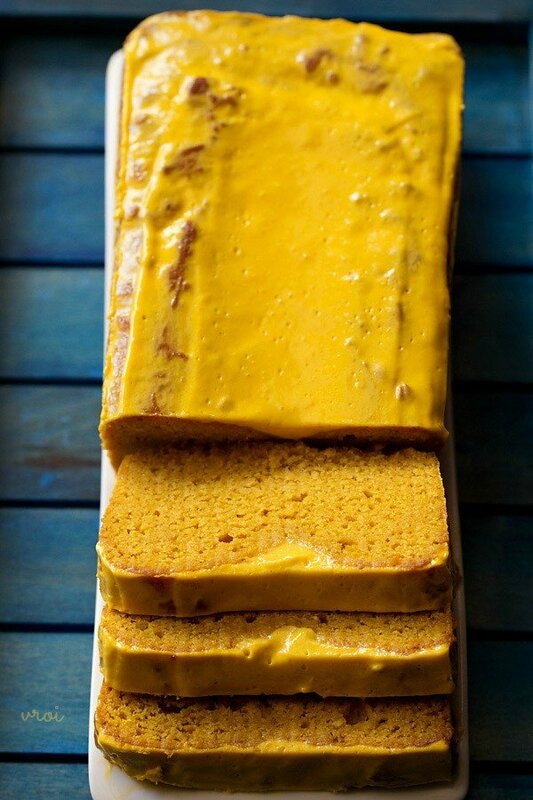 5. once done slice and then serve the eggless mango cake with mango mousse frosting. The recipe looks good..but I’ve a confusion. Its mentioned 1 cup is 250ml ..so while measuring whole wheat flour you mentioned 1.5 cups which comes to 375 gms..but you have stated it as 180 gms..please can you clarify?? debashree, the cup measure is in volume which is measured in litres. solid ingredients are measured not in volume but using their dry weight. so 1 cup of atta when weighed on a weighing machine minus the cup, weighs 120 grams. so 1.5 cups of whole wheat flour will be 180 grams. or you can say this way that 185 grams of flour occupies space in 1.5 cups. so either you use the cup measure or the weight measure. cups come in various sizes like 200, 240 ml etc. so this recipe uses cup measuring 250 ml. I am a big fan of your website and all your recipes 🙂 everytime I try them, its a big thumbsup without fail ( yesterday I tried your vegan banana bread for the 2nd time and it came out amazingggg). This Mango cake looks incredibly delicious, but do you think there’s anyway to make this Vegan ( without the butter and condensed milk?). Let me know if you think so. Thanks in advance. Thanks Vidhya for your kind words. 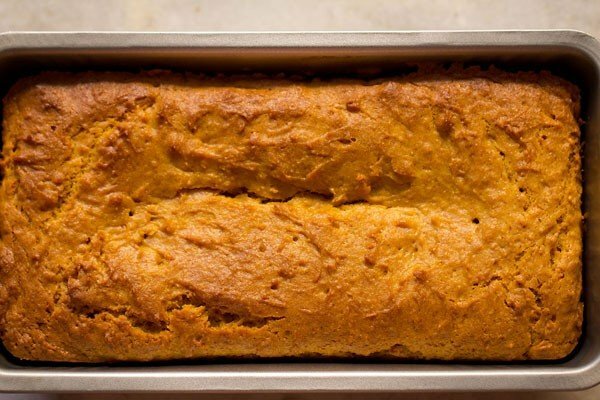 There is a recipe that I make which is vegan but it is mango bread. I have not yet shared this recipe but will try to add. In this recipe, lot of changes has to be made so difficult to answer. The first attempt was disastrous and the cake got burnt. I followed the steps and preheated oven in convection mode for 15 mins followed by 35 mins of baking time. thanks a lot shubs. it appears your oven bakes faster. for any cake recipe, timing is just an approximation. one has to consider the timing, keeping in mind, the size, type and make of the oven. larger ovens usually bake faster, than smaller ovens. also convection ovens bake faster than traditional ovens. grated chocolate is a lovely addition. both mango and chocolate goes well. I am a regular to your recipes. 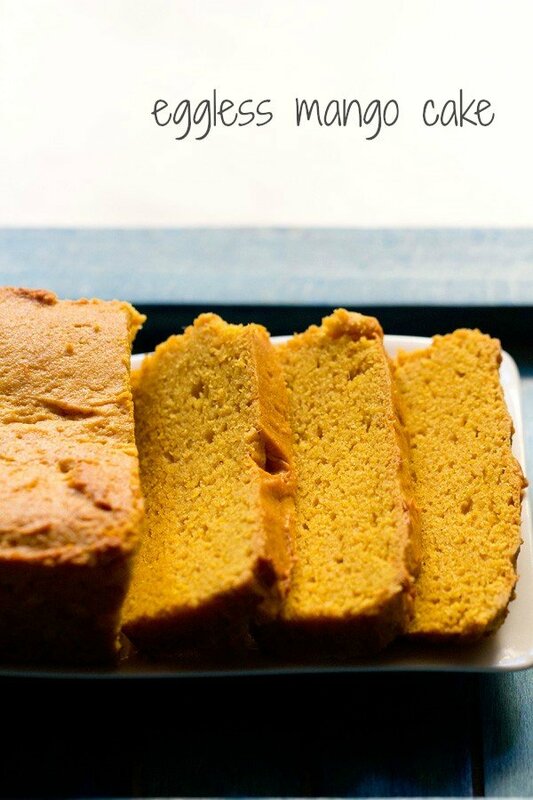 I’ve baked the eggless mango cake several times and it’s a hit everytime. All thanks to ur superb recipe. The best part is that my 6 year old son is so keen in helping me baking it. I bake this cake mostly in pressure cooker and it comes out soft, spongy and moist. Welcome Aditi. Glad to know this. Thanks for sharing your positive feedback. I had never tried this mango cake in pressure cooker. So good to know this. I made this cake….. it was just awsome…. everybody loved it…… but the thing is, there was no mango smell like I thought it would be. now I am thinking to use this same recipe to make a pulm cake woth ripped pulm puree…. will it be okay? if I increase the sugar amount as pulm puree not as sweet as mango, will it still come okay? 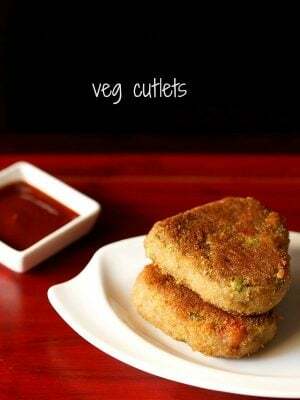 plz reply me….. and of course thank you very very much for this wonderful recipe. thanks farhina. in the cake there is just a slight aroma of the mangoes. its not very pronounced. to get that strong mango flavor, mango essence has to be used. for the plum cake, you can try. you will have to increase the sugar. i feel the recipe should work. Could I use canned coconut milk instead of condensed milk? I would love to try this recipe and make it vegan. I’m allergic to dairy. 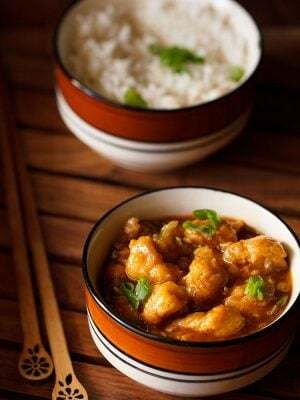 use can use thick coconut milk and prepare the recipe. it will work. It turned out beautifully! Thank you! Easily one of my favourites! great ashwini. i will also give a try. thanks for letting me know. mango and coconut is one lovely combination. The cake and mousse frosting turned out excellent, my family loved it. Few things to keep in mind – I baked on lower rack of oven and cake was done in 25-30 min, so keep watching. Make sure the cake sets nicely after frosting, so give it enough time in the refrigerator. Thank you very much Dassana!! thanks sonal for the positive feedback and for sharing your suggestions. you are welcome always. Whole wheat atta means, which one did u use.?? Chapatti atta ?? 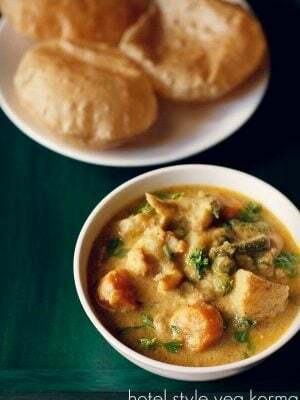 chapati atta – one used to make chapatis. the one i used was chakki ground. Thank you so much for this great recipe. I made it and it is really great. i also shared the photo in my instagram page (lily_simone7) and shared your link too. thank you lily now we know where we are getting traffic from? and you are welcome. Can i make this same recipe with egg?? you can. 2 to 3 eggs should work. no reader yet has mentioned that they have tried mango cake with eggs. i tried the recipe , as u told the consistency of the batter differs with flour and mango so mine was a lil thin than urs . it baked well as in the pic only but once cooled down it dropped in the centre and wen i cut the centre was lil not done . what do u think would have gone wrong . cake sinking could be due to many reasons. it can be uneven mixing or too much mixing or uneven temperatures in the oven. since you mention the batter is thin, it should bake well. usually uneven temperatures happen when the oven door is opened many times. the air outside which is cool, rushes into the oven, causing the temperature inside to fall down, which affects the baking of the cake. usually only after the cake is 3/4th baked, then the oven door should be opened. i also hope you used the right size of pan. i hope these suggestions help. nagashree, will think about it. thanks for the suggestion. Thank you!! if I have to simply put it, you recipe’s are amazing and you have a huge fan following in my family now!! I have tried your Banana Walnut cake, Chocolate Cake and Mango Cake, with your measurement of Ingredients, they tasted really good and came out really fluffy and nice!! My only concern is with the Mango cake, even if the smell of Mango is present when I bake, but when it cools down I can hardly taste Mango, Is there something i am missing out? To bake this cake i used 1 big Mallika (local variant, which was very sweet and had a good smell) along with Alphonso measuring 1 Cup(250 Ml) together. thanks rajashree. the aroma of mango will be there. but the taste of mango will be not like fresh ripe mangoes. the taste will be mild, as there are other ingredients too. in mango breads and cake, the aroma is felt, but the taste is not mango dominant, unlike a mango ice cream, mousse or custard. hope this helps. i am not sure how the recipe will turn out with hersheys chocolate syrup. 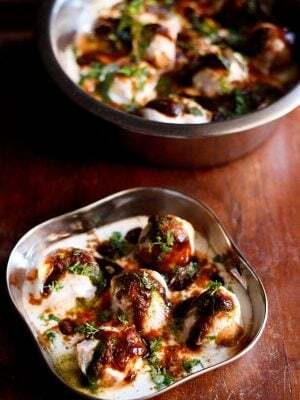 Can I substitute condensed milk with amul mithai mate?